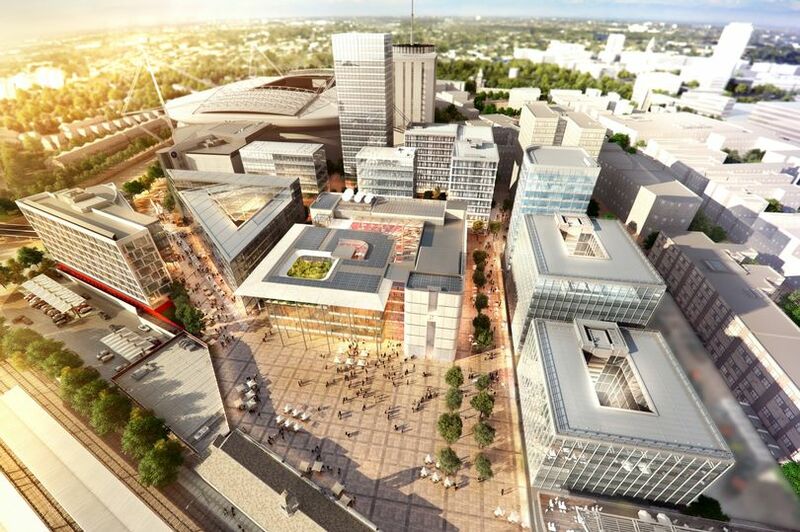 he Central Square regeneration scheme in the centre of Cardiff has been chosen as the location for a new headquarters for HMRC in Wales that will employ thousands of staff. After drawing up a shortlist of three locations, all in the centre of the city, it is understood that the Government Property Unit (GPU) of the UK Government has identified the regeneration project, located immediately in front of Cardiff Central Train Station, as its preferred location for a new tax centre in Wales that will employ up to 3,000 staff. HMRC has already confirmed it is leaving its existing largest tax centre in Wales in the Llanishen area of Cardiff. Its new HQ, which could range from 280,000 sq ft to more than 300,000 sq ft, is earmarked for an undeveloped site at Central Square where the former printing press and head offices of the Western Mail were located. Central Square, where work is progressing on a new £120m HQ for BBC Cymru Wales, is being developed by property development firm Rightacres Property in partnership with Cardiff Council. The project will eventually see up to 1 million sq of new office, residential and retail space developed - with the backing of a £400m investment from financial services giant L&G. There are also plans from the GPU for a second phase of public sector offices to create a new public sector hub in the centre of Cardiff. This could potentially see more than 200,000 sq ft of new offices built for non-devolved civil service departments in Wales, including the Ministry of Justice, Companies House and the Department for Work and Pensions. While no decision has yet been made on the location for this second phase, there is more than enough space at Central Square to accommodate 500,000 sq ft for a public sector hub in a single location. The existing St David’s House building at Central Square will create further space next to the preferred site for the HMRC when it is demolished. Last year HMRC announced that Cardiff would be one of 13 new super regional tax centres across the UK. It will see 2,000 staff, currently located at its main Ty Glas operation in Llanishen, relocating into the new HQ in the summer of 2019. And the process of moving staff out of Llanishen has already begun with the government department taking 50,000 sq ft of short-term office space at Brunel House in the centre of Cardiff. While a number of regional tax offices in Wales will close, it is expected to see a net increase of around 1,000 jobs. Combined with other public sector operations the hub could have a workforce of 5,000. After an extensive property search the GPU drew up a shortlist of three locations earlier this year after ruling out an existing surface car park site close to the Wales Millennium Centre in Cardiff Bay and a five acre undeveloped land site at Callaghan Square, which is owned by the Welsh Government. On the shortlist was a bid from family-run company Rapport for a two acre site covering a car park and offices it owns at Bridge Street. It had teamed up with property development firm Stoford. And the other shortlisted site was from property development firm JR Smart for a two acre site it acquired last year at John Street-Callaghan Square - next to its Capital Quarter regeneration scheme. It is understood that HMRC will pay an inflation linked rent of £16 a sq ft per annum on a 25 year lease with no break for its new HQ. As is usual in property lettings of this scale, HMRC will have an initial rent free period. The cost of building a new HQ for HMRC would be around £100m. Rhydian Morris of the Cardiff office JLL, who is advising the GPU and HMRC, declined to comment. Rightacres also declined to comment. The contract for the new HMRC office in Bristol was signed this week and they are hoping to confirm the new office in Cardiff & Liverpool early in the new year and Belfast before Christmas. They will not confirm until its a signed deal. Not long to wait. So no idea what the building is gonna look like, though i suppose finishing Central square and environs is better than spreading development thinly across Central square and Callaghan square. Shame as i liked the plans for Callaghan square. It wipes out plans for the tower on that plot and the residential development in front of it. So much for master plans eh?! Not that I blame Rightacres. I hope they build something tall-ish. how does this affect the john street plot then? it's a good investment isn't it? it fills in the awful hole in the ground? could it speed up the demolition of st davids house? I'm actually not sure how good news this really is. If they are willing to pay only £16 a square foot and with a rent-free period, I can't see how it'll be a good building: its about £8-10 down on what Rightacres have been achieving in their latest lettings in 1 Central Square. For that sort of money, I'd imagine a pretty bland and boxy building. Perhaps its a saving grace if this is hidden behind St Davids House rather than fronting on to Wood Street itself. I'm also a little surprised that Rightacres were able to offer a more financially attractive proposition than JR Smart. Perhaps the market for city centre flats is still in the doldrums, depressing capital values? Perhaps the taller build proposed by JR Smart couldn't but brought in for such a poxy budget. Or perhaps they thought operational efficiency favoured a lower building with larger floor plates. What will go on the John St - Callaghan Square site now? Its hard to imagine anyone else wanting quite such a large building. Could they go for a smaller (shorter) building, circa 100,000 square feet? Could they try to put something more mixed use here? In the main and without seeing what is now proposed for HMRC central square, I am disappointed. I really liked the building that was proposed for john street (surely that's a gonna now?) also I loved how it would've got activity 'the other side of the track' and have been a very significant part of the callaghan square masterplan. Perhaps it's a little bit 'back to the drawing board' on Callaghan Square now - yet again! So I guess the next thing is waiting to see what is actually proposed at Central Square for HMRC - perhaps it's along the lines of the rightacres original plans for the buildings there, but now they'd be connected? Well given the timescale on all this we should know pretty soon shouldn't we? This is pretty awful news all round really. Instead of getting a newly proposed building, we're just getting a change-of-use of a previously proposed plot. Bad news for the Rapport site, John Street, and anything south of the tracks. I'm also worried that RC might be right. At £16 per sq foot this could turn out to be a really poor build, and they know they can get away with it now that the brutal downgrade of the transport interchange has basically been approved. It is a 25 year lease with no break. Thats pretty good for the developer or whowever they sell the building to. Plus there are bound to be ground floor commercial units. Lets say they have 3 years rent free and then 300,000 sq ft for the remaining 22 years at £16 per sq ft. Thats over 100m over the lifetime of the lease for the office element only. Finance wont be a problem with such good lease terms and a fairly decent covenant from a govt. department. A £10m build is likely to result in a relatively decent building. It may also entice further govt departments who will be happy to get brand new Grade A, city centre offices at £16/17 per sq foot on long lease terms (the fabled Ministry of Justice perhaps)? On the plus side this is likely to mean that Central Square will be one of the few schemes that actually gets completed. No 1 is up and running, the BBC and No 2 are currently being built, there will be immense political pressure to build the bus station and now the final part of the scheme appears to be pre-let. On the downside where does this leave Callaghan Square? The John Street scheme was good and it would have actually made CS feel like part of the city centre. With Capital Quarter continuing to entice tenants I can't see CS being completed for the next 10 years. That will be 25 years since it commenced construction. The only hope I can see is south side being used for a convention centre/new arena.